It’s time to turn my attention toward executing the business plan I’ve been working on for the past 12 months. 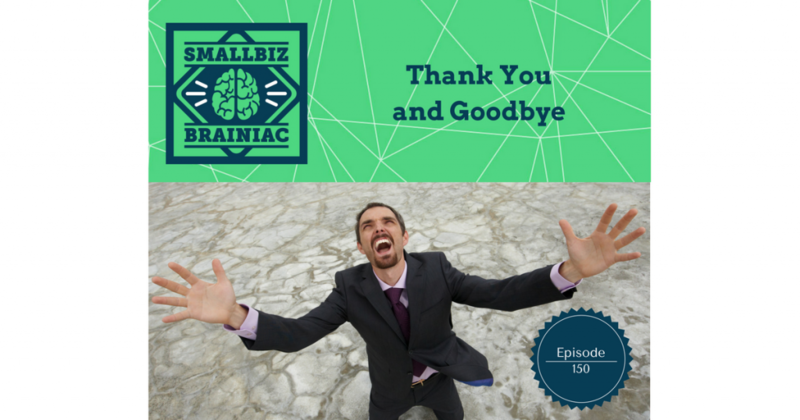 Hey everybody, welcome to the FINAL episode of SmallBiz Brainiac! Yes… I’m ending this podcast. That’s hard for me to say, actually. This has been a labor of love for me and I’ve learned so much from doing this. It was a bit scary starting off. If you go back to the first 100 episodes… I pretty much sucked. I think the content is solid but as a podcaster, I stink… still do. So, I’ve been thinking about ending the show for several weeks now, and I’ve finally decided that it’s time to turn my attention toward executing the business plan I’ve been working on for the past 12 months. When I started this show 17 months ago, I didn’t have a clear picture of how I would incorporate it into my business. In fact, I started it before I had my current business. At the time, I was in a role transition. I almost said career transition, and that’s kind of true except I’m still in the same industry, just a different role. In 2015 I decided to resign from my position as the Chief Operating Officer of a large and growing Professional Employer Organization called Vensure Employer Services. But after almost 23 years of being in the operations side of the business, I needed a change. There are a lot of reasons why I made the difficult decision, but I didn’t realize how much the job was a part of my identity until I was no longer the COO. Walking away from it was a mixture of emotions. After all, I co-founded the company with my Uncle back in 2004 and I was the CEO until July of 2012, when the new majority shareholder came in and took over that role, and I stepped into the COO role. Since then, the company has gone through a lot of changes, it has grown significantly, and is now a major league player in the PEO industry. I’m really proud to have been a part of the company’s success, and to have helped create something that is doing so well today. Even though I resigned from Vensure, I’m still working with Vensure. I now own an insurance agency. But this isn’t your traditional insurance agency, it’s more like a business advisory firm. 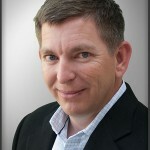 I’m on a mission to use my two and a half decades of business operations, accounting, insurance, HR, payroll, and risk management expertise; and my newly acquired marketing skills, which includes my ClickFunnels Certified Partner status, to make small business owners’ insurance premiums go further, to get more services… and better service, without spending any more than they already do. And Vensure is a big part of how I do that. But let me get back to the point… which is when I started this podcast, my next step wasn’t clear. The origins of it actually go back to 2014. Fortunatly, I now have a clear vision of my path, and this podcast, SmallBiz Brainiac, isn’t the right fit. And so, it will be replaced with a new show later this year. One that will be perfectly aligned with where I’m going. If you want to get an email announcing the launch of the new show, go to smallbizbrainiac.com and sign up for the brainwave newsletter, and you’ll be the first to hear about it. So, thank you, thank you, thank you, for listening. I hope you’ve learned a few things from this podcast. The one lesson I’d like you to take away is that you should hire a PEO to help you not just survive as an employer, but to thrive as one. You shouldn’t go at it alone. It’s too dangerous out there. Everyone wants a piece of you…the regulators, politicians, competitors, lawyers and leeches. A PEO is like your suit of armor. It will help protect you as you head into battle.